I am not denying the sheer mystical beauty, the science and the perfection of Leonardo Da Vinci's masterpiece but paintings as the one below titled "Gypsy Dancer" cannot be ignored. Click on the images to view them in a bigger size. 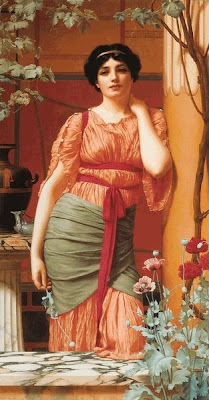 This one is by John William Godward, an English painter who committed suicide at the age of 61. In his suicide note he mentioned that the world wasn't big enough for him and a Picasso. He created several other paintings of women but "Gypsy Dancer" is my favorite. Another popular painting is "Nerissa". Try and see if you can view bigger images. The attention to details such as color, female anatomy, art, architecture and vegetation is stunning. 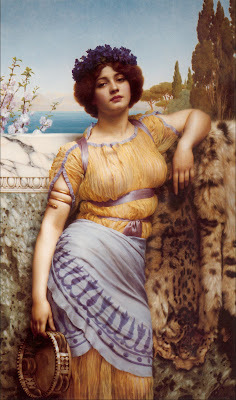 John Willaim Godward was shunned by his family because he took to painting as a profession and being ashamed of his suicide, burnt all his papers. What a tragedy!